Home /Blogs /John Tierney's blog /The Survey of Old Kilcummin, Killarney, Co. Kerry. The Kilcummin Historical Group, decided to survey and publish this historic graveyard from a genealogical heritage perspective. What differentiates genealogical heritage from history is a focus on families - people. Genealogists are all about people and the purpose of this training survey was to learn how to quantify a whole graveyard and to record the genealogical details of the grave monuments using high quality, robust systems which even a genealogist would be happy to use. When faced with a larger than average graveyard our main tactic is to split the graveyard into discreet areas or sections. In discussion with the local team we split Old Kilcummin into 3 areas. The N point, N of the ruined church has had a lot of modern burials with accompanying kerbs and polished marble headstones. We started numbering here, working from W to E (back to front) and from left to right as we identified burial rows. The same pattern was followed then in areas 2 and 3. Inside the ruined church was the last numbered portion of Area 2. Numbering goes back to front, left to right. It makes sense when you do it and starting numbers on the left hand side of each row gives a tidier survey. We write the numbers onto a square of masking tape and stick this to the shoulder of each monument - an arrow is sometimes drawn to tell the recording teams that the next headstone is beyond the tree or back at the start of the next row. We do not number rows though! Some graveyard surveys will say memorial #1 in row #2. That is too many numbers for my simple brain and one thing we have learnt as field archaeologists is that complexity results in error. The simpler we keep things the less problems we have to solve and the better we can concentrate on the monuments. We identify rows but we only use one number throughout the survey and that is monument/memorial number. It’s technical detail but we do differentiate between a monument and a memorial when we fill out record sheets - a monument is meant to be permanent while a memorial can be relatively impermanent. A memorial can be a wooden cross or an iron nail - in one graveyard we have seen a plastic folder used as a grave memorial - these memorials are about remembrance but not permanence. 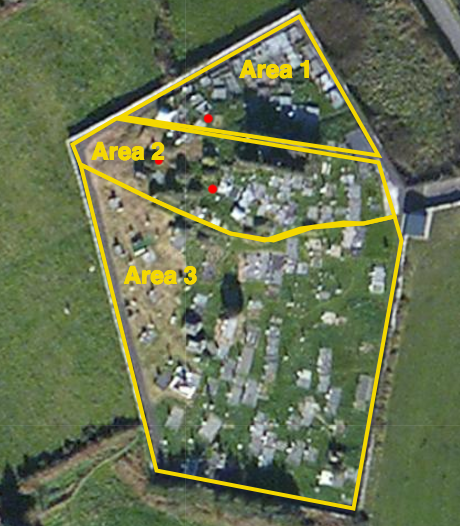 The Kilcummin Historical Group and their volunteers were trained in all of the tasks of a graveyard survey. Numbering, photography and how to fill out individual record sheets. Every task is done in pairs - pair recording results in higher quality results and we use pair systems regardless of the experience level of the team. In genealogical heritage identifying the exact year carved into stone as a headstone with an epitaph saying John Murphy died 1931 can be a completely different person to John Murphy died 1932 recorded in a burial register. Each recording team uses a torch, mirror or water bottle to read the surviving epitaph. The flat recumbent slabs which were used throughout the 19th century can have over 14 rows of text on them - a watering can and soft brush can be the simplest tool needed to read these stones. Pour the water, spread with the soft brush, removing excess and then read the inscribed text. As the water dries out different details may be revealed. The camera team consists of a spotter and a photographer. The spotter identifies the next headstone to photo and communicates this clearly with the photographer. The photographer takes one photo per monument - taking care to “Fill the Frame” and “Centre the Image”. We allow a hands width of space at the top of the monument so that the full monument can be seen. The photographer gets to see every monument in the graveyard so it is a prized position but there is also responsibility to have good quality images as we believe the survey photographs are likely to be an important resource long into the future. The photographer must also check the photo image number after every single photograph and the masking tape number and photo number must always match. If a mismatch occurs then we correct the error immediately in the field - a golden rule of field archaeology is to fix all problems in the field - never leave it to offsite as it won’t get done or will slow down the analysis stage. Throughout the two training days there was constant talk amongst the recording teams. Neighbours collaborate and discuss and write down that they see. Recording a graveyard is like experiencing a 3D crossword puzzle. Kneel down, shine the torch, call out the epitaph - write - check the record sheet. Rinse and repeat - each team averages one headstone every ten minutes and by the end of day 2 up to 200 headstone sheets have been sorted, checked, punched and filed. Progress is obvious, we started at the back wall and now we’re at the front - so must be getting somewhere. To beginners a graveyard can appear higgledy piggledy but mid-way through the first morning people begin to learn that they are highly organised spaces and that the trick to doing a good quality survey (which doesn’t take forever) is to understand the spatial organisation of the burial ground. Once we do understand the social organisation of the burial ground we can begin to understand the social organisation of the parish and the families who have lived here for over a 1000 years. 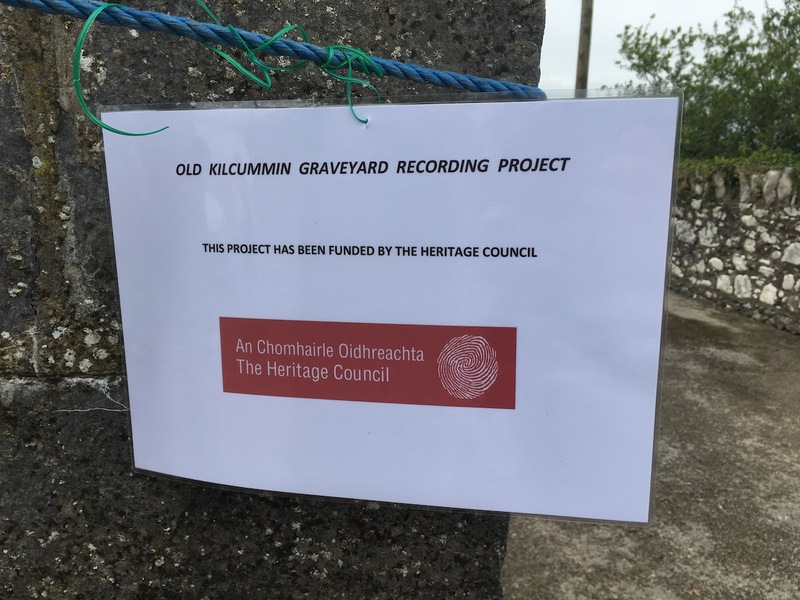 Over fifteen people spent two full days in Old Kilcummin as part of the Heritage Council funded project. So over 30 person days of recording got nearly 400 headstones numbered, photographed and recorded. Work continues to finish and double check the recording sheets and the dataset will soon be online - free and openly available to people around the world. Thanks to two teams in Kerry County Council. The Heritage office who gave permission for this survey and the cleaning crew who cut, raked and removed the rather tall grass which covered parts of the site. One thing which struck me is how similar these Kerry grave monuments are to the over 20 graveyards surveyed in Duhallow and Sliabh Luachra to the immediate E. Indeed Old KIlcummin graveyard is perhaps the W-most burial ground of the Sliabh Luachra region and it would appear the Kilcummin families buried here would also have attended funerals further east in Co. Cork and that monumental sculptors along the borders of Cork and Kerry would have plied their trade across the county bounds. 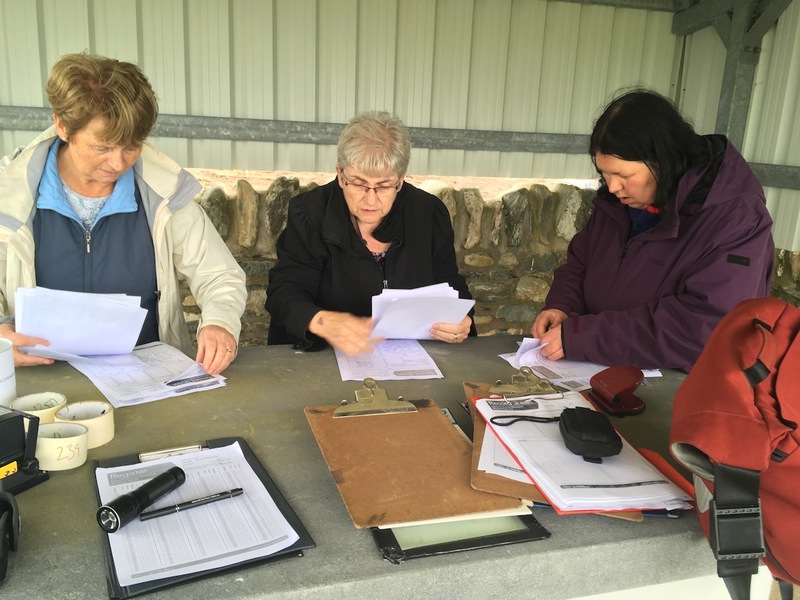 Once the survey data is online the community group intend to add extra genealogical data to the grave monuments - thus helping those who seek to trace their forebears and heritage in Co. Kerry.